I’m calling this part 1 because I have a feeling this topic is going to end up being a series. For now I’m going to call it “Lessons I’m Learning From Not Following My Own Advice” but that may change if I can come up with something snappier sounding! Have you ever been asked this before? Do you even know what I mean? Let me ask it a couple different ways. What priorities in your life are you not willing to ignore? What activities do you consider essential to keeping your sanity? It is a big question. One that you may sort of know but never gave it much intentional thought. My framily (friends who are family – did I just create a new word?! Cool!) have posted in their kitchen, a simple note. Faith, Family, Friends, Money, and Business. Nice, quick, simple and easy to remember. My list, as usual, is a bit more wordy. Faith: Daily time reading my bible and spending time with God. Family & Friends: Be available when I am needed, spending quality time with them. Exercise: Daily. Get moving to reduce stress and improve my physical and mental well-being. Creativity: Finding ways to express myself and nurture my creative side. Today’s Follow-up Question: Do any of these non-negotiables get on your schedule? I’ll go first. Not. Very. Well. Sort of. Sometimes. If you read my list of non-negotiables and saw how I spent my days you would not see alignment. Much of my list has become my wishlist. I can tell you first hand that when you ignore the items on this list you will eventually pay for it mentally, physically and emotionally. 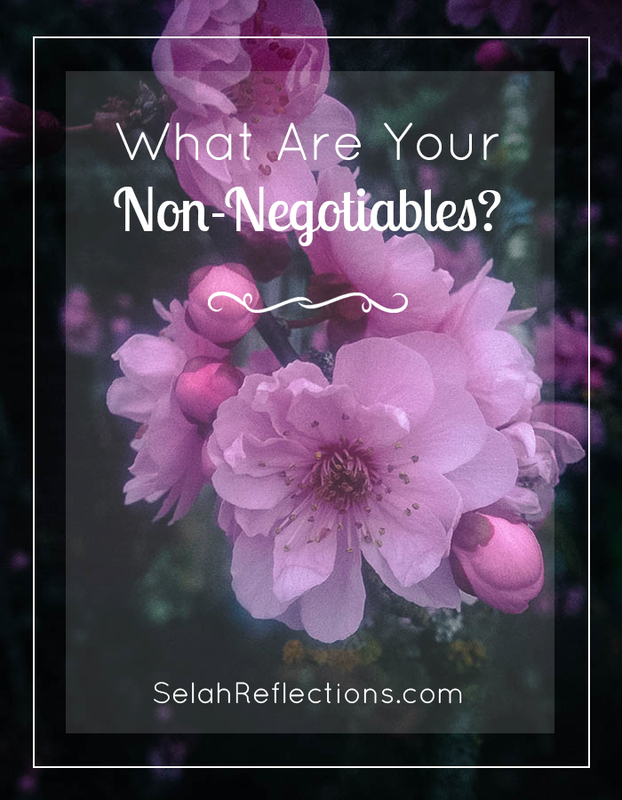 How Do We Keep Our Non-negotiables… Non-negotiable? To be honest, I’m still figuring this one out. The pull on my time can become so great, I don’t know how to keep these on my calendar. But I also know that by investing my time in this list, my life is better for it. I feel better, less stressed, and more balanced. In thinking through how to improve this in my own life, I came up with a few ideas and issues we need to look at. #1: Give yourself a break. Don’t try and catch-up. Be okay with days here and there that just don’t go the way we want. Start small. Pick one item from your list and start there, start soon, but start where you can. #2: Let go of the expectations of others. We glorify busy. We fill our schedule with work, housework, chores, exercise, kids school, kids activities, pets, grocery shopping and more. When, or if, we slow down and have some free time, we immediately try to fill it up with something else because we do not want to look lazy. We start comparing our situation with someone else’s and feel wrong about not being as busy as they are. Keep in mind, that is their choice, their life and their responsibility. Do you really want to be as busy as they are? Get it on your calendar, block out that time and honor that commitment to you. You (I) am not being selfish. These are things that need to happen so we can keep our heads on straight, not be so stressed out and be fully present with family and friends. I’m giving both you and me permission to put one non-negotiable on the calendar for next week. I think mine will be a photo shoot for one of my still photography classes. Your list will evolve over time. What you need today might be different in 6 months. And that is okay! Take a close look every few months and do a self-evaluation. Are you keeping your personal commitments? Have your needs changed? The core of my list has stayed generally the same over the years, but I have added to it from my 2015 words.